Every the year the National Poisons Centre receives up to 2000 calls regarding older people who have accidentally poisoned themselves. Mistaken identity is the most common form of poisoning in the elderly. Often they attempt to read labels without their glasses or in the dark, or automatically reach for a medication that has been moved from its usual place only to pickup something else by mistake. This group is most likely not to store products in original containers because they generally use smaller quantities and often share products with family and friends. Grandparents homes may also be less prepared for small children, and may be less "poison-proof"
Read and follow the directions and warnings on the label before taking any medicine. If you have any questions about the intended use of your medicine, contact your doctor. Be aware of potential drug interactions. Some medicines interact dangerously with food or other medicines. Your doctor should be made aware of all medicines, prescription or over-the-counter, you are currently taking. Talk to your doctor before taking any natural or herbal supplements. Old and outdated medicines should be disposed of or returned to your pharmacy. Some medications can become dangerous or ineffective over time. 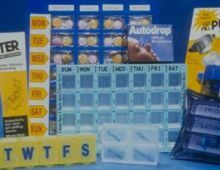 If you have difficulties remembering if you have taken your medication, talk to your pharmacist about getting your prescriptions in pills trays or blister packs. Always remember when the grandchildren are visiting to put medicines and cleaners out of their reach. For free poisons advice call 0800 POISON (0800 764-766).